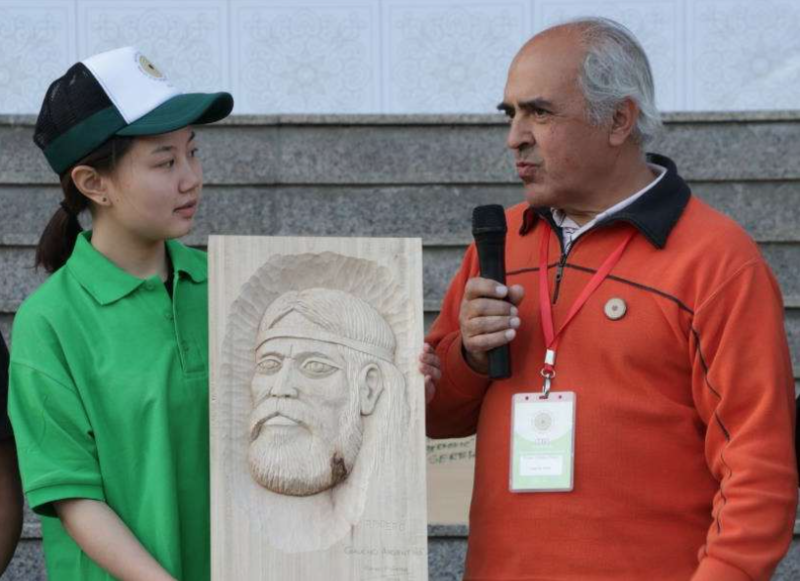 An opening ceremony kicks off the International Woodcarving Art Festival at Beijing Forestry University on April 2, 2014.
International Woodcarving Art Festival, a post-2014 WWD cultural exchange event, was held to celebrate the concept of “Wood is Good” at Beijing Forestry University from April 2 to 3. 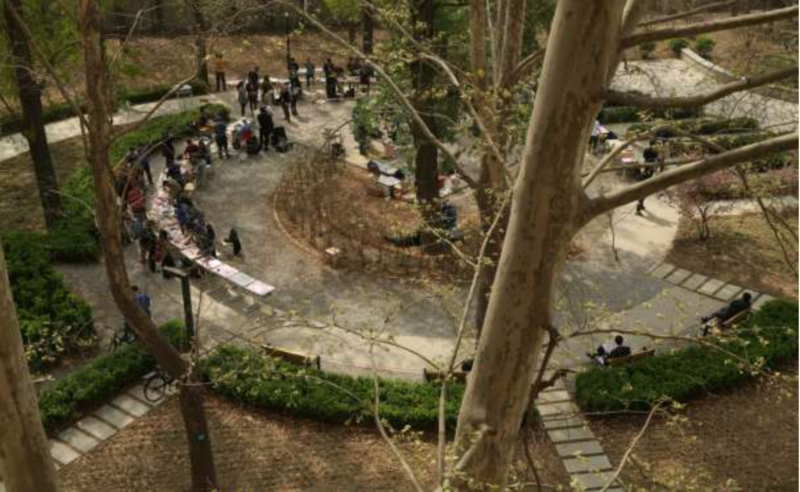 Strewn with flowers and trees everywhere, the Beijing Forestry University is worthy of the name. Vice President of the school, Director of IWCS and international and domestic representatives addressed the opening ceremony. 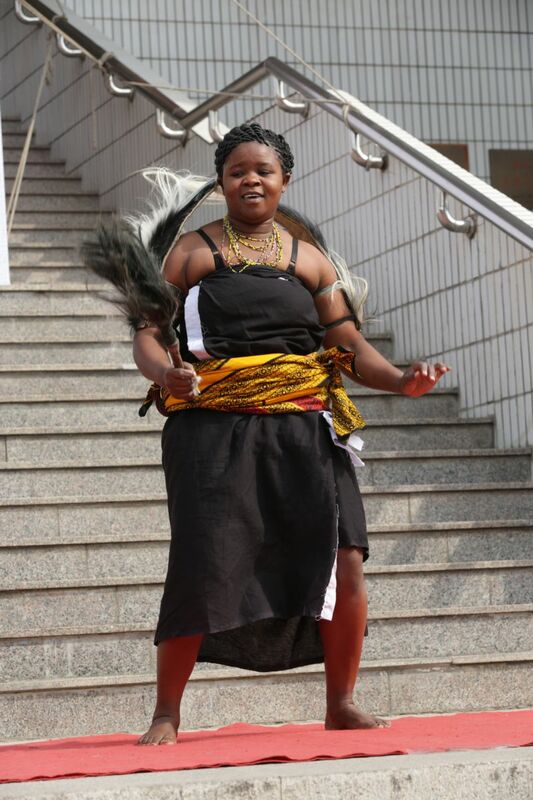 Followed were performances of traditional culture of China and Africa presented by Chinese students and international artists. Traditional Chinese music is presented by the student band of Beijing Forestry University, April Wind, at the opening ceremony. The Tanzanian Police Band performs African wooden drum dance on the open stage. 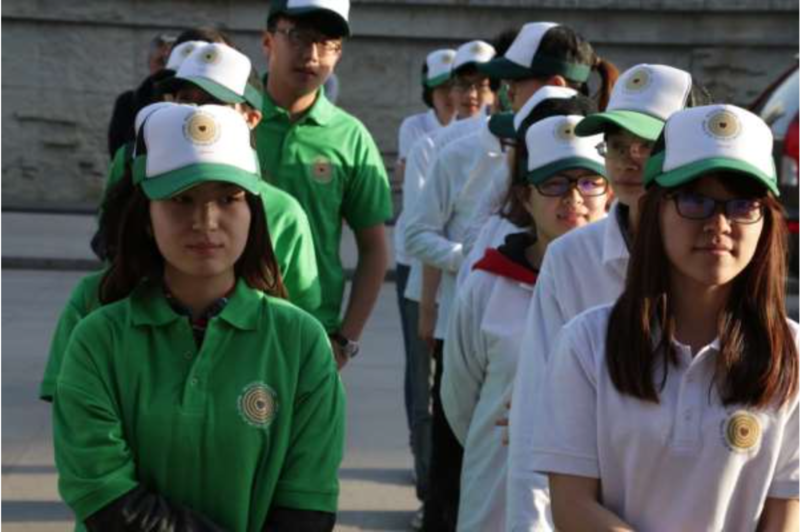 The student volunteers, who play a significant part in the Festival, are well prepared to help around during the activities. 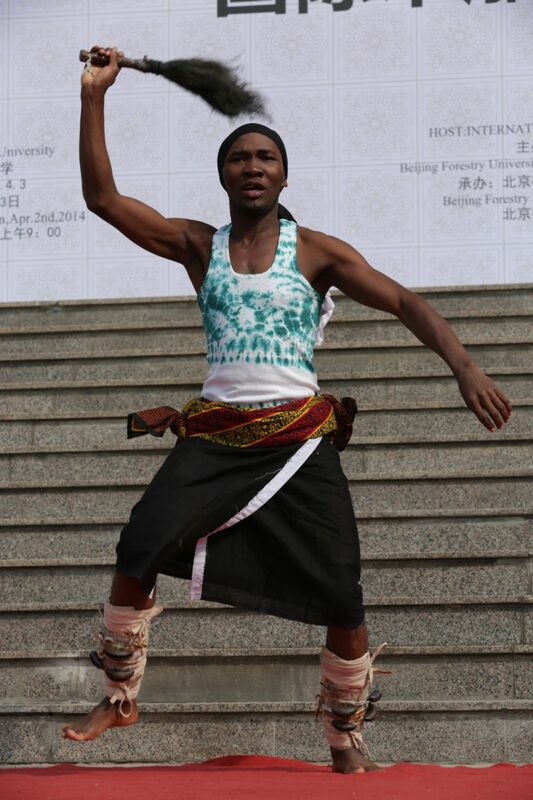 Cultural exchange is a primary focus of 2014 WWD activities. 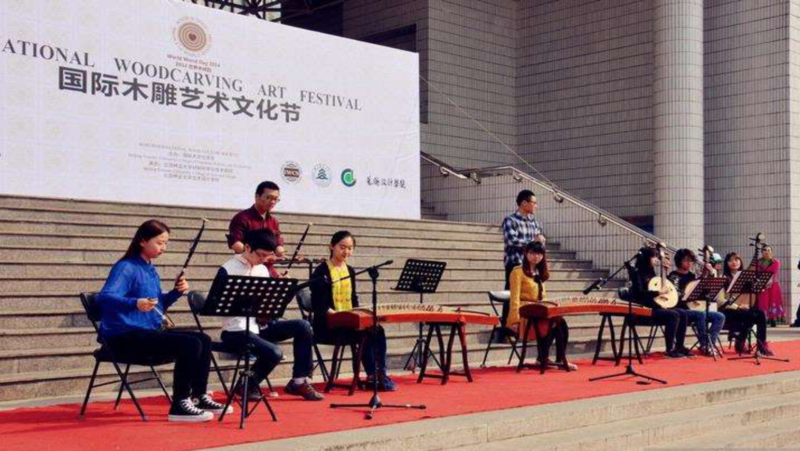 The Woodcarving Art Festival was a landmark initiative co-organized by the Beijing Forestry University and IWCS. 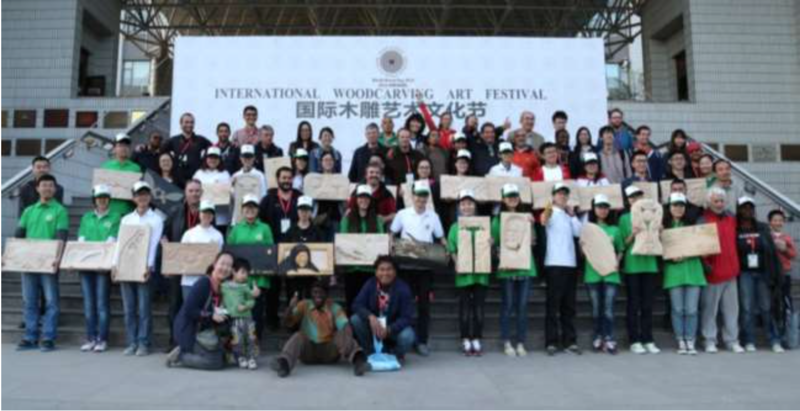 It brought together forty-six artists from across the world with the aim to share wood culture with a range of academic audience. 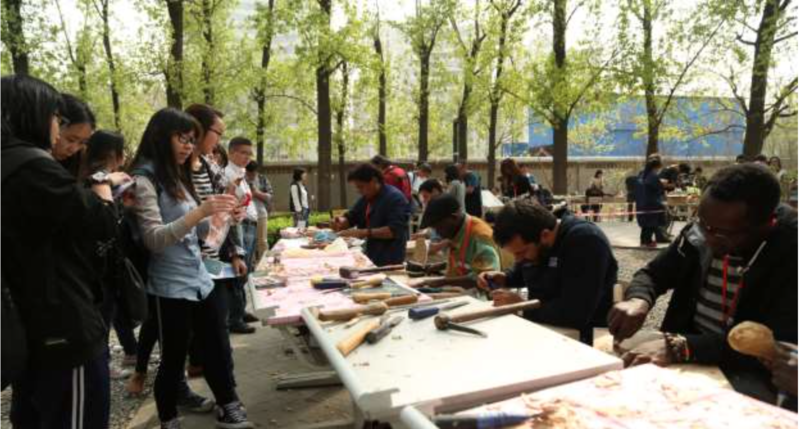 The woodcarving activities take place at an open site with natural surroundings on the campus of Bejing Forestry University. 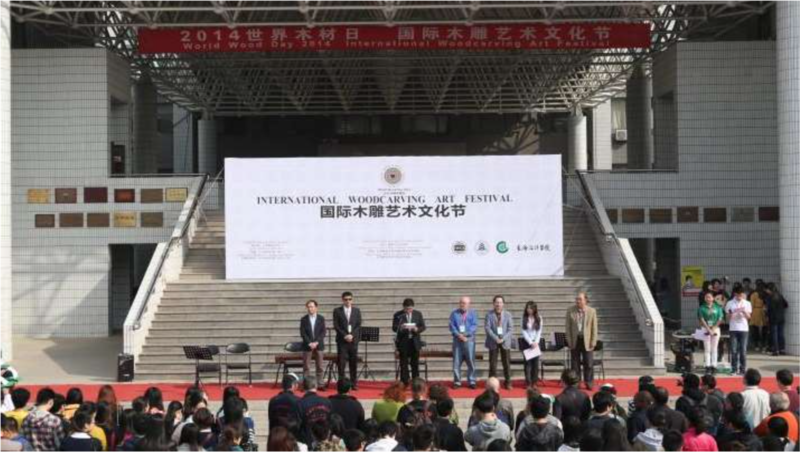 Two large-scale collaborative works were to be created by thirty-five international artists in the woodcarving show. Each artist was allowed to have his own concept and expression conveyed through one of the individual pieces that composed the collaborative works. 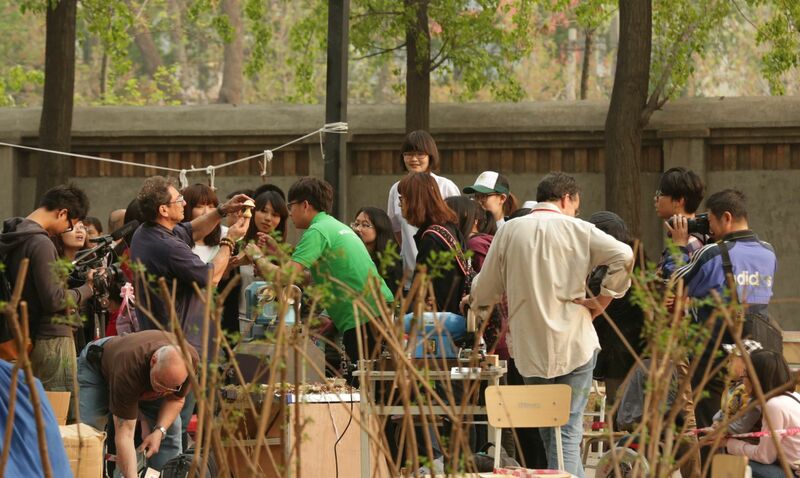 Visitors and students take photos while artists are carving under the warm spring sun. 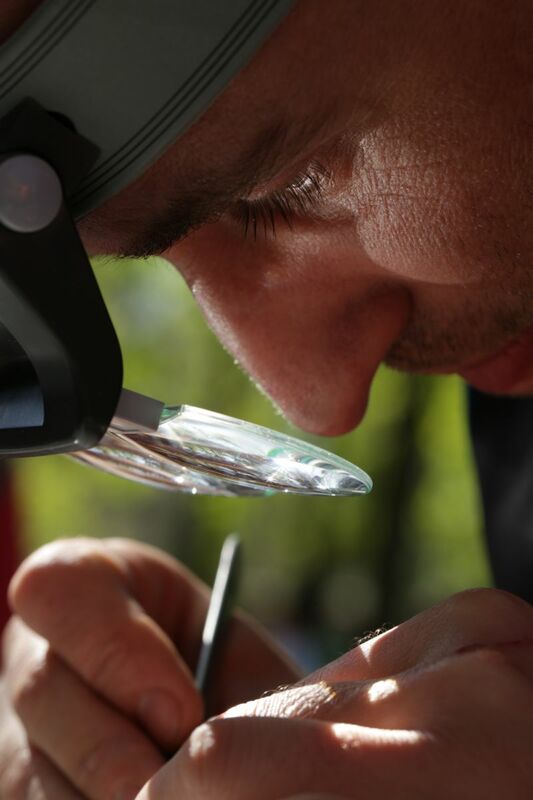 Each artist shows their expertise on an individual piece. 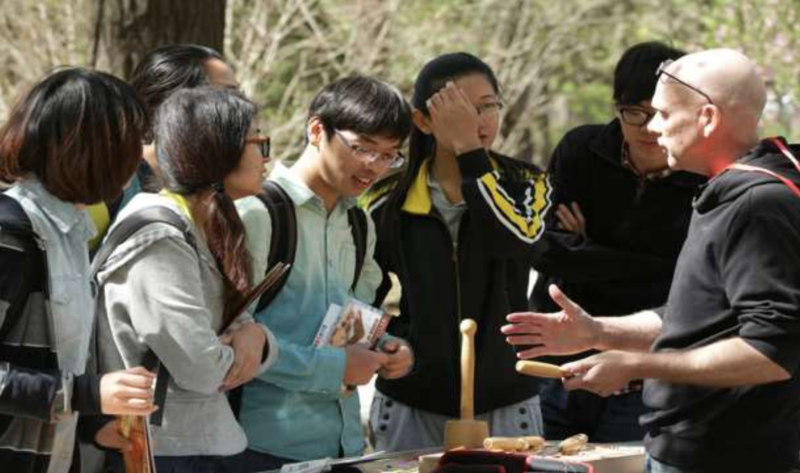 Exposed to the feast for woodcarving that presented by those with different cultural backgrounds, many students learned to appreciate the wood art and craft of various styles. 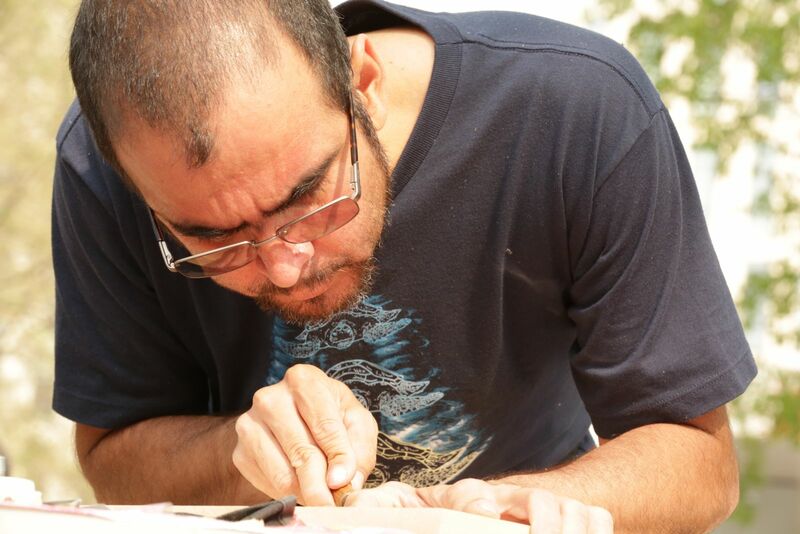 The woodcarving artists work on their own piece expressing what’s on their minds. Watching the art and craft demonstrated by the artists is truly pleasing and inspiring to the audience. 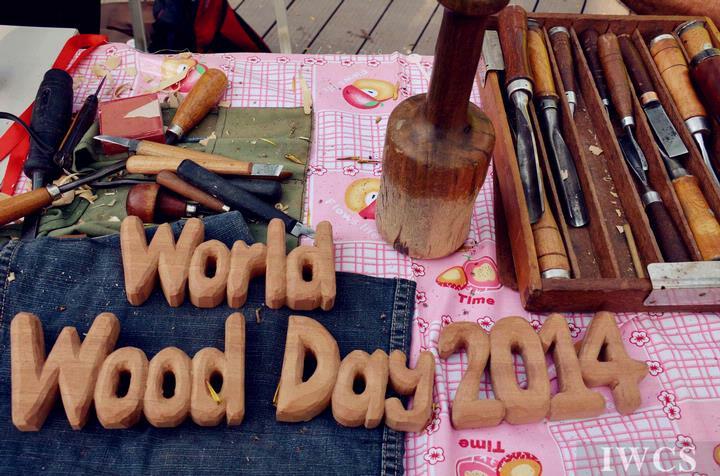 Many found the wood art and craft interesting and appealing. 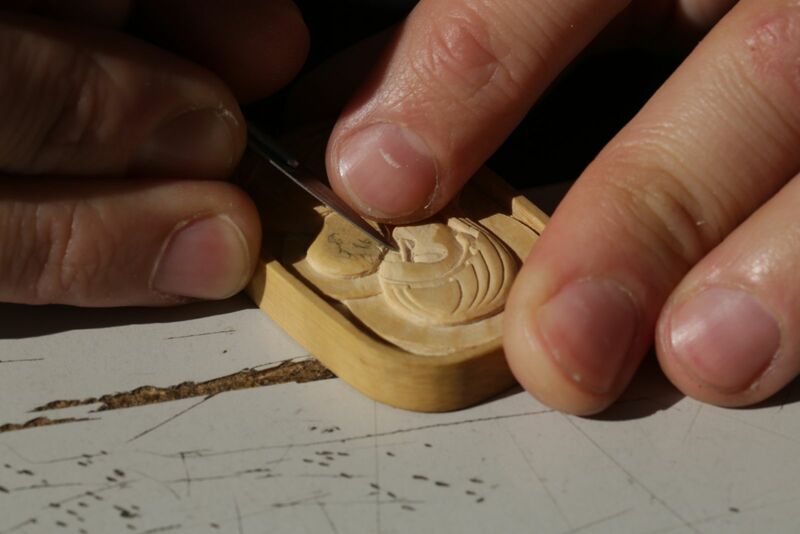 Some students were encouraged to try carving by the artists to experience the art, while others explored woodcarving from around the world with the artists’ guidance. Friendly interactions between artists and students lent charm to the live show. 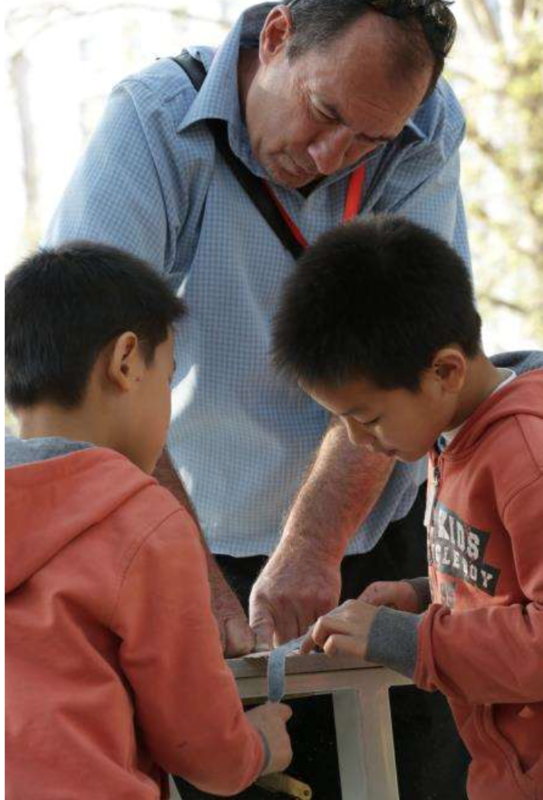 The enthusiastic students listen carefully to the instruction of the artists before trying to carve. 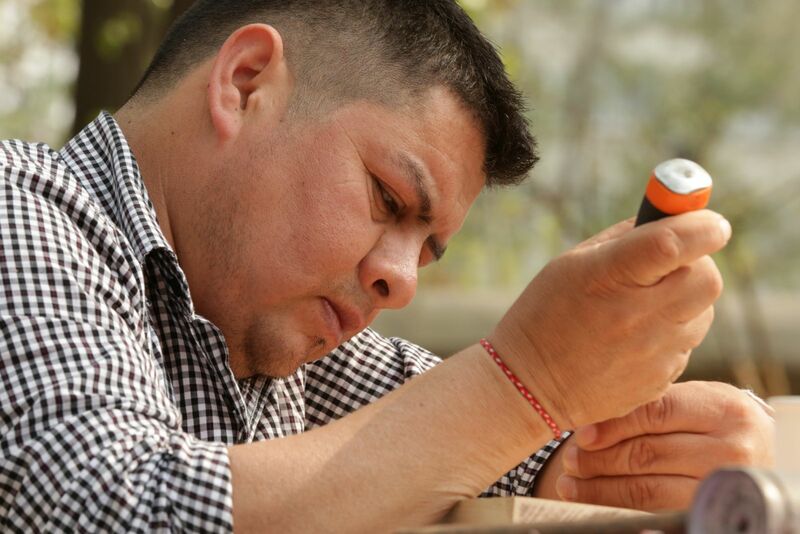 The artist helps the students to understand wood art and craft. 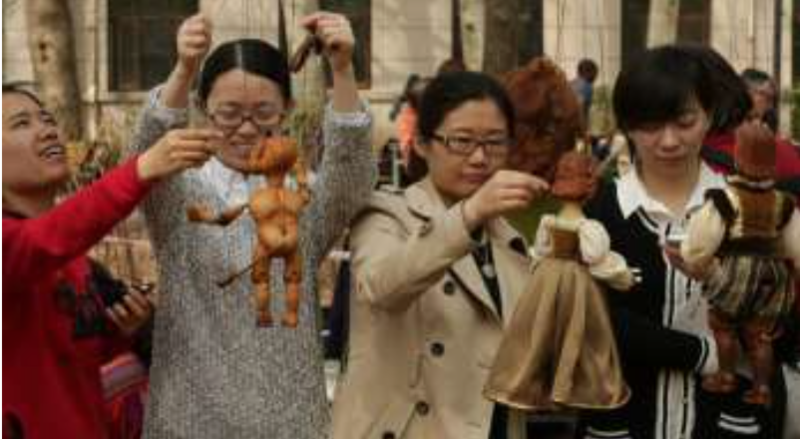 The Slovakian puppets displayed on the site catch the attention of both kids and adults. 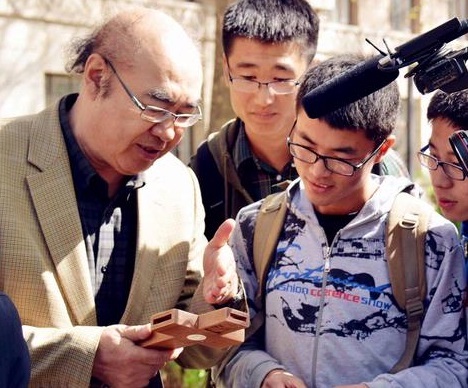 Prof. Guangjie Zhou explains the artwork made by an international artist to the students. 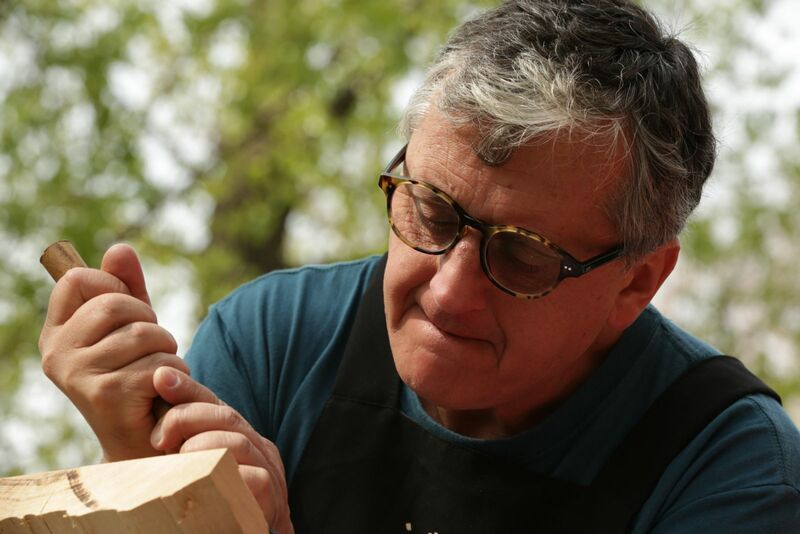 A woodcarver and a woodturner join hands to create a single piece. 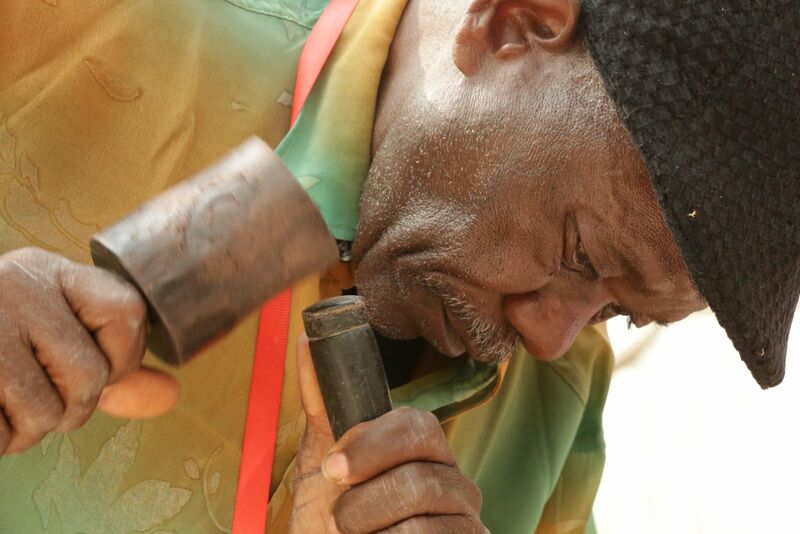 Another feature of the event was the woodturning demonstration. Laughter and delightful conversations filled the air. Everyone had a good time working or visiting during these gorgeous sunny days. Students and visitors crowd the woodturning site. 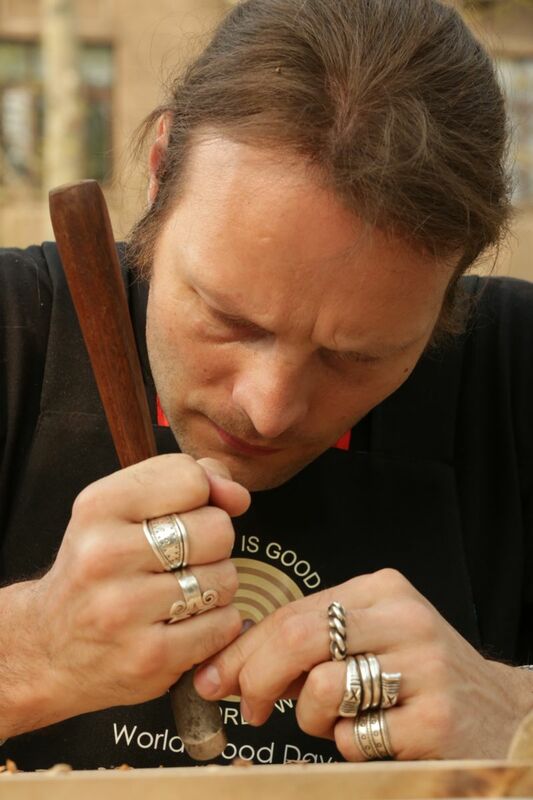 Irish woodturner, Adam Doran, demonstrates woodturning. 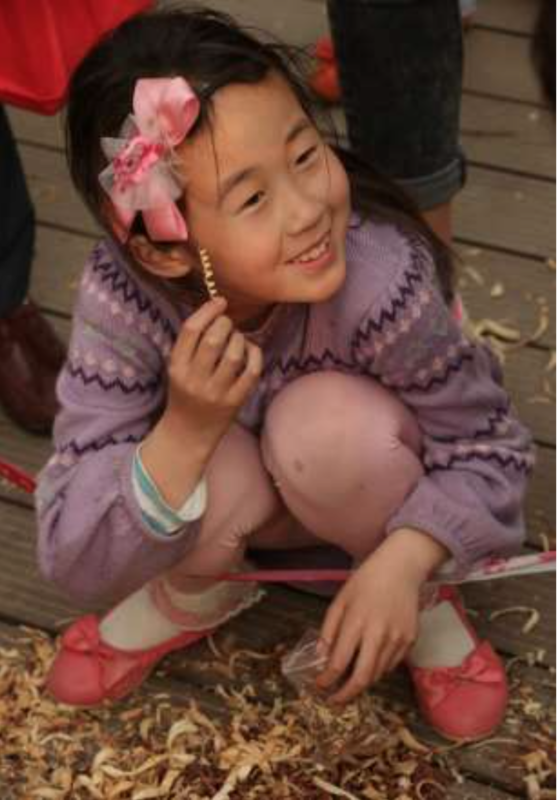 Children grasp the amusing elements of the activities. 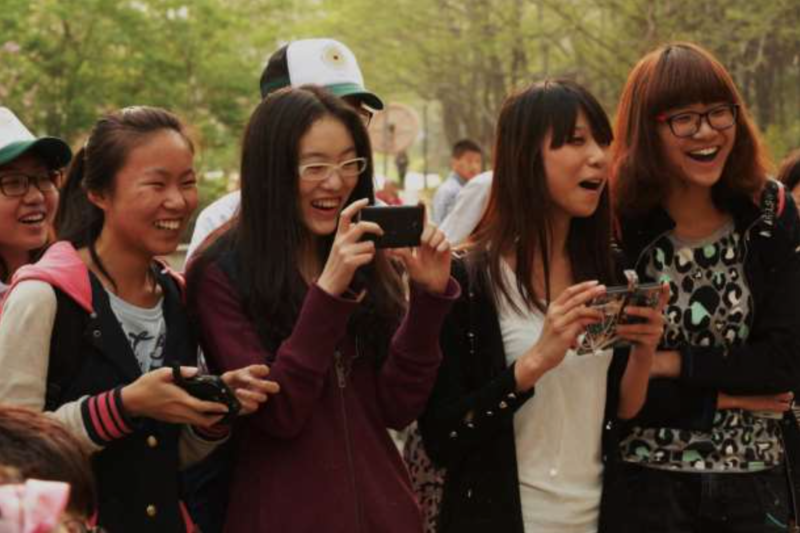 Students have much fun watching and photographing the demonstration. 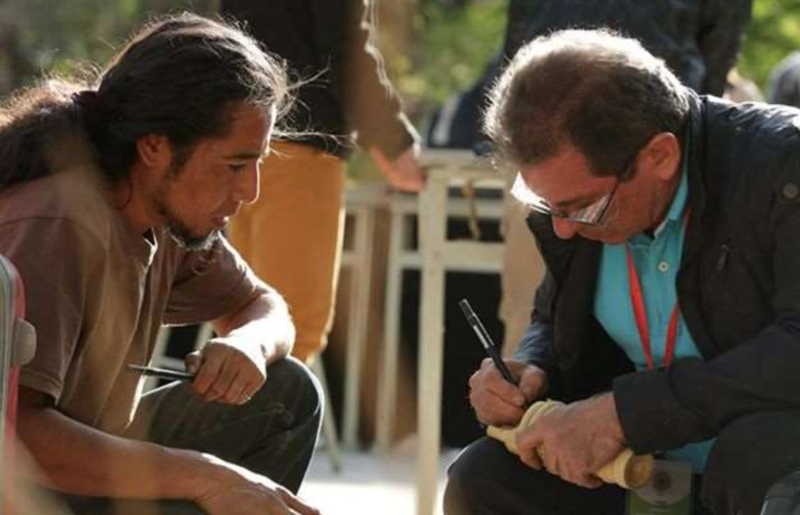 Five international artists gave presentations pertaining to art and culture of woodcarving and woodturning, regional architecture style and furniture making. An interactive discussion followed each of the two sessions respectively. It was expected that the students’ vision in their specialized academic fields could be broadened by a multi-cultural activity of such. 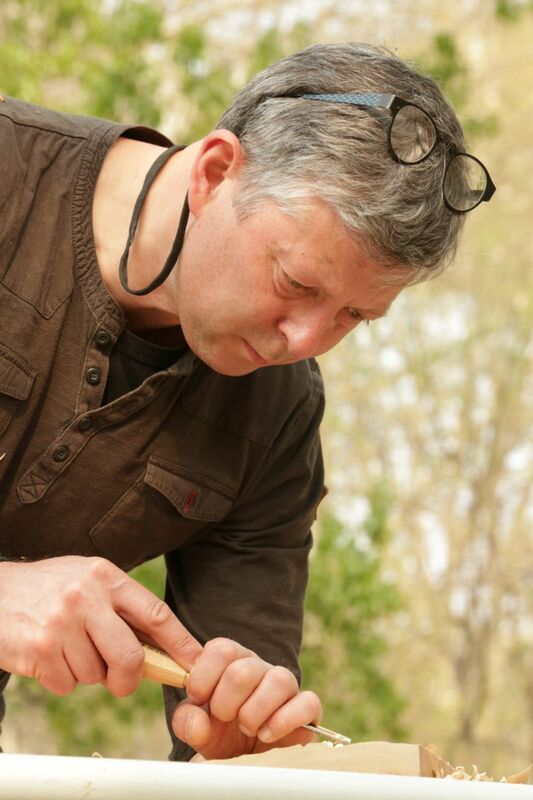 Terry Martin, an Australian woodturner, gives a presentation on the art of woodturning. 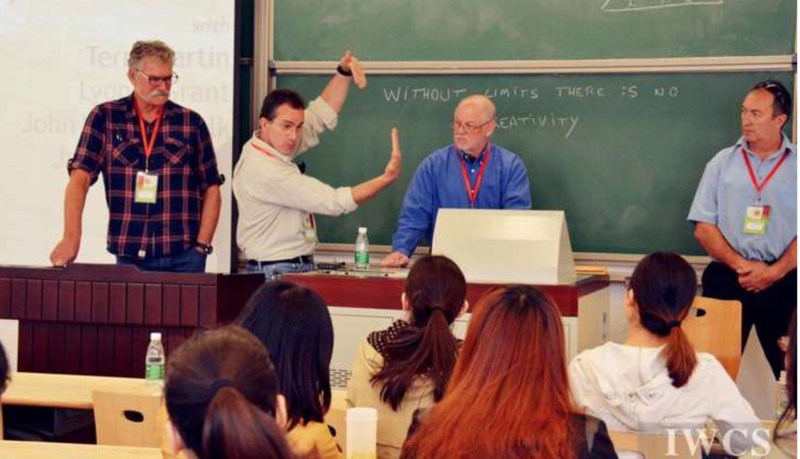 The interactive discussion led by the International artists engages the students’ interests. 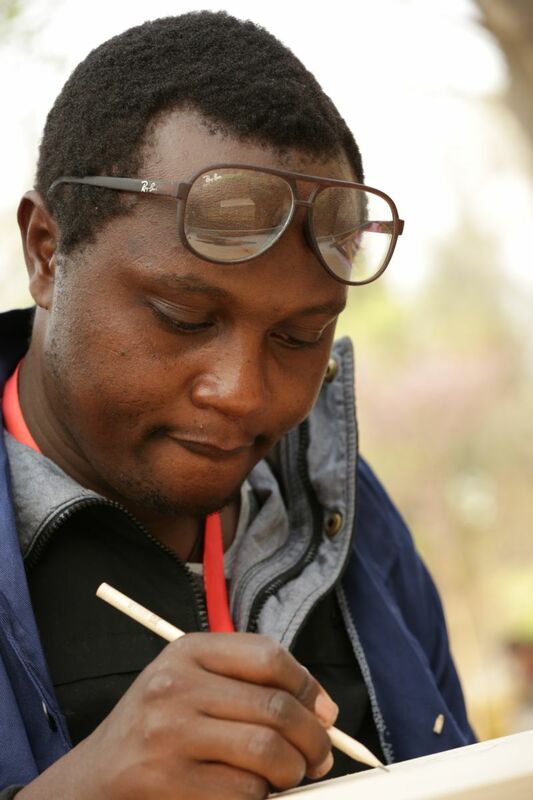 At the closing ceremony, the whole finished artwork was dedicated to the College of Art and Design and College of Material Science and Technology of the school as a remembrance of the cultural exchange. The introduction of each individual work was presented by the artists on stage. The themes of their works mostly reflected in nature, family and their home country. Each artist shares the ideas and inspirations of their artwork with the audience. 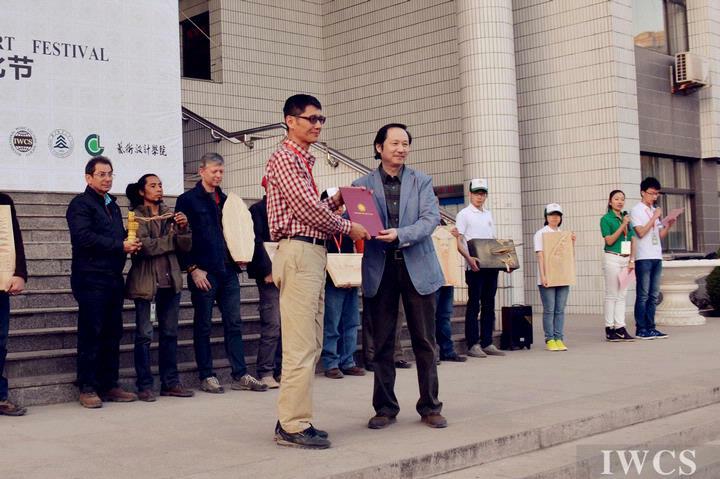 Mike Hou, Director of IWCS, and the international artists present the Certificate of Donation and the collaborative works to representatives of the College of Material Science and Technology (top) and the College of Art and Design (bottom). 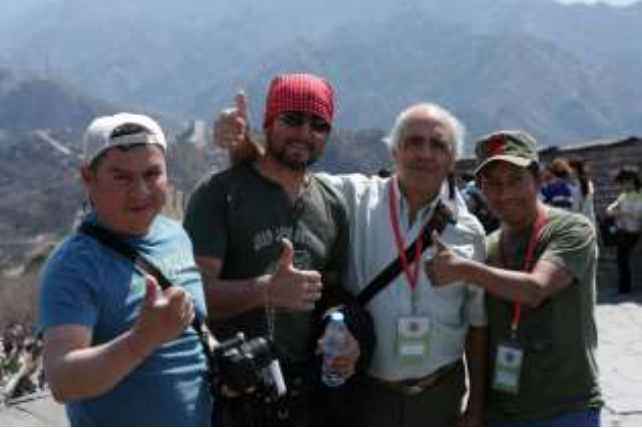 Everyone cheers for the success of the collaboration when the volunteers hold the artwork and posing with the artists at the closing ceremony on April 3, 2014. 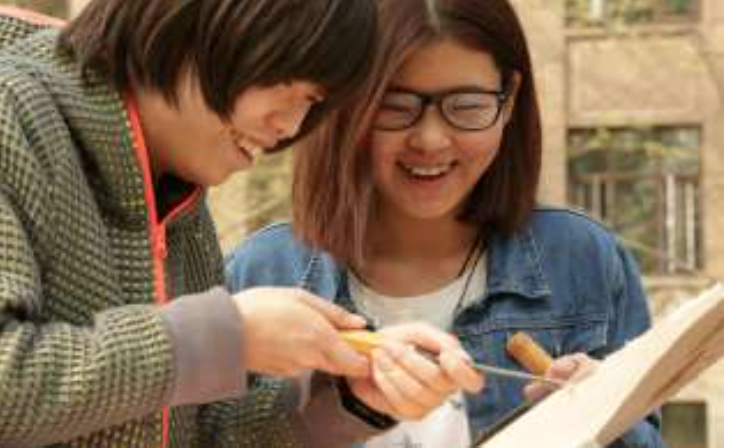 Thanks to everyone who took part in the event, the results were really impressive in bringing forth intercultural communication through woodcarving and woodturning activities on campus. 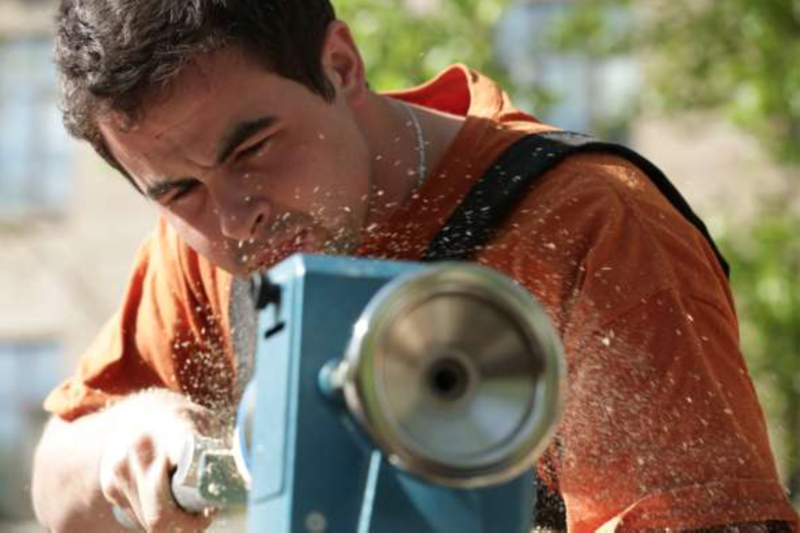 The participating artists integrated the global-scale wood culture into the academic community. Wood culture has thus struck a chord with the future generation. 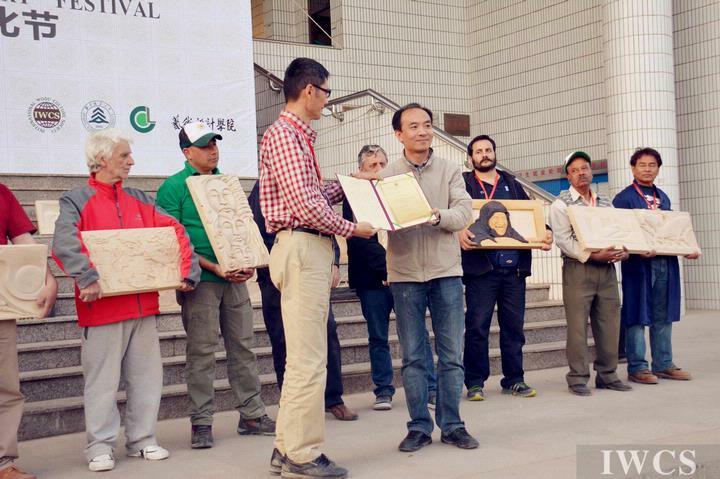 The International Art Festival marks the finale of the post- 2014 World Wood Day events in Beijing, China. 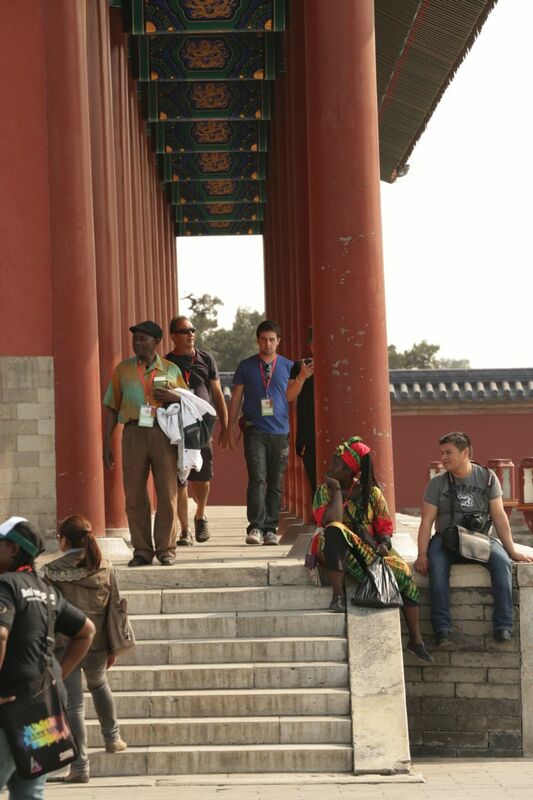 The international artists spent two days touring the most prominent historical sites in Beijing on April 1 and April 4. 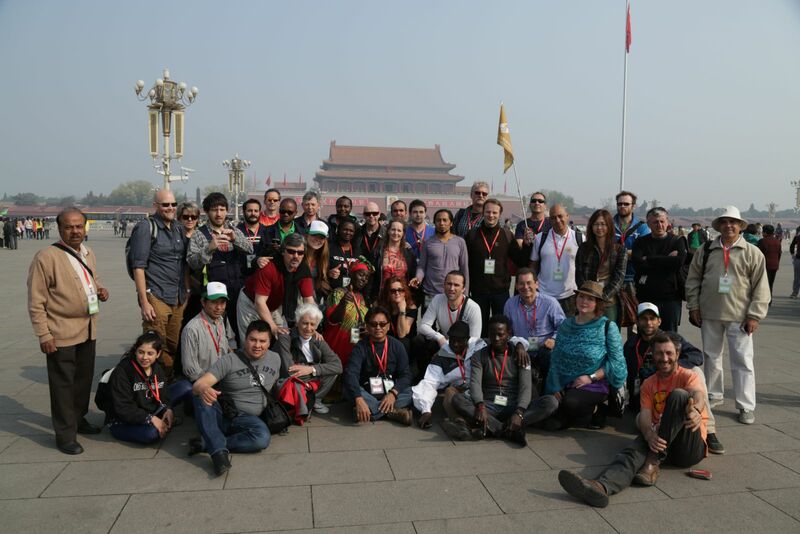 The culture tour featuring the Tiananmen Square, the Imperial Palace and the Great Wall gave them a glimpse of the essence of traditional and architectural accomplishment of the old China. 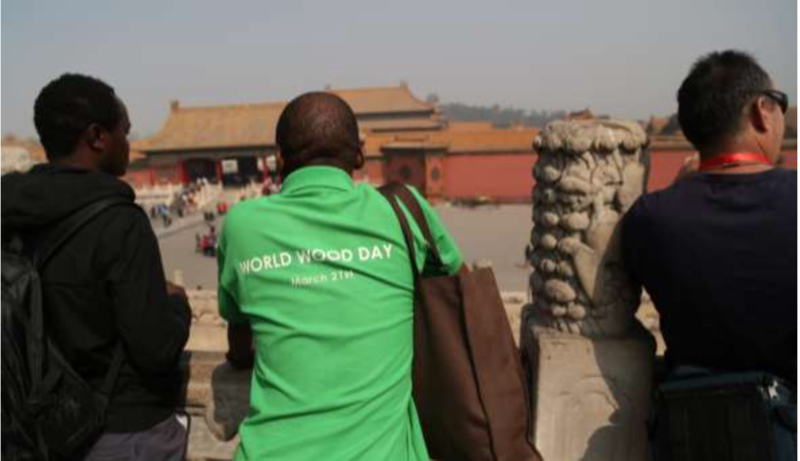 The 2014 WWD artists pose at the Tiananmen Square, the largest city square in the world, at 440,000 square meters. Some artists gaze at one of the buildings in the Imperial Palace that is also known as the Forbidden City and is now home to the Palace Museum. 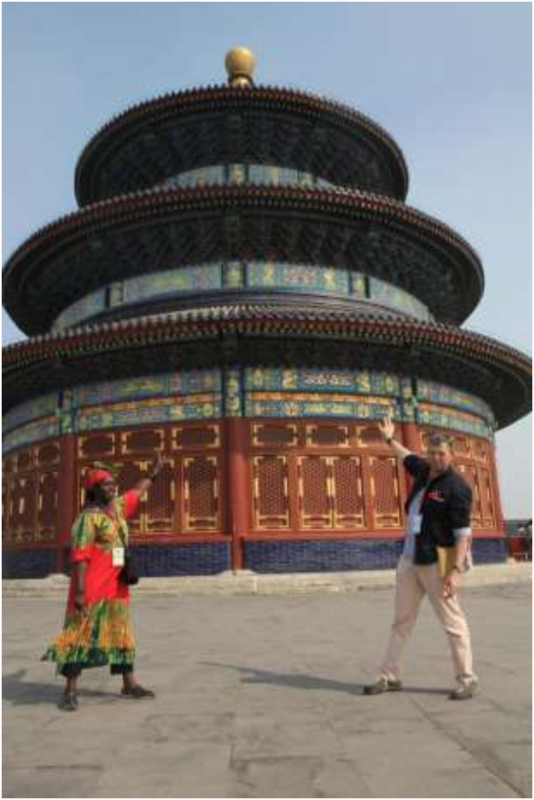 The Temple of Heaven was an imperial sacrificial altar where the emperors of the Ming and Qing Dynasties came to worship Heaven and pray for a harvest at winter solstice. 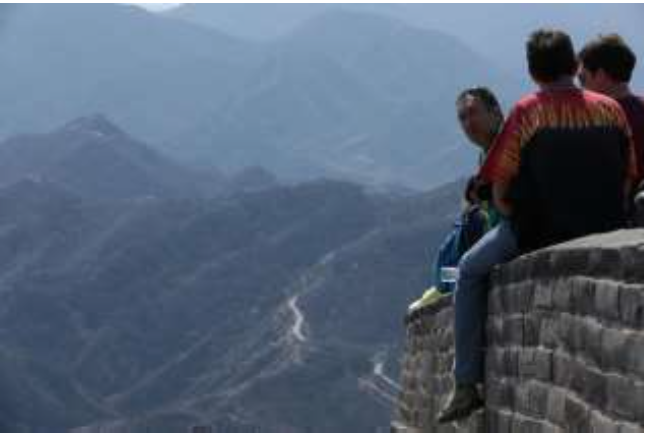 As the world’s biggest ancient architecture and the longest fortification ever built, the Great Wall attracts the international artists and many tourists. 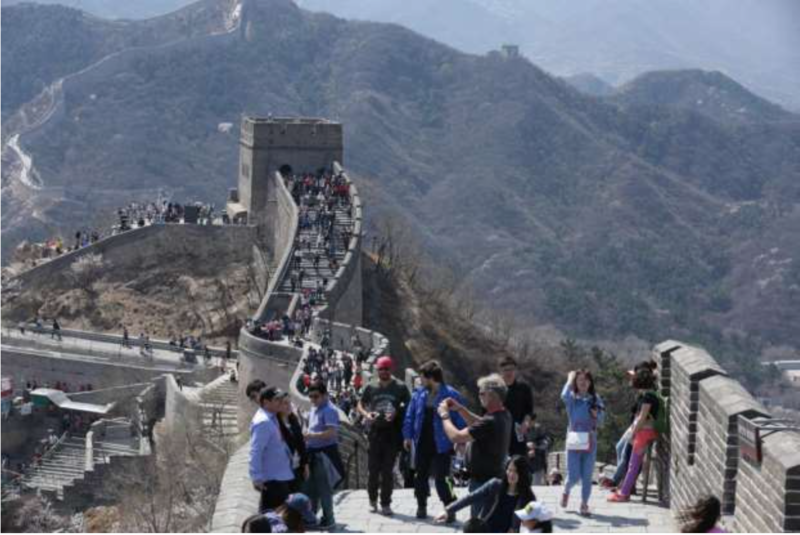 Artists have fun and relax at the Badaling section of the Great Wall that was listed as a World Cultural Heritage by the United Nation. 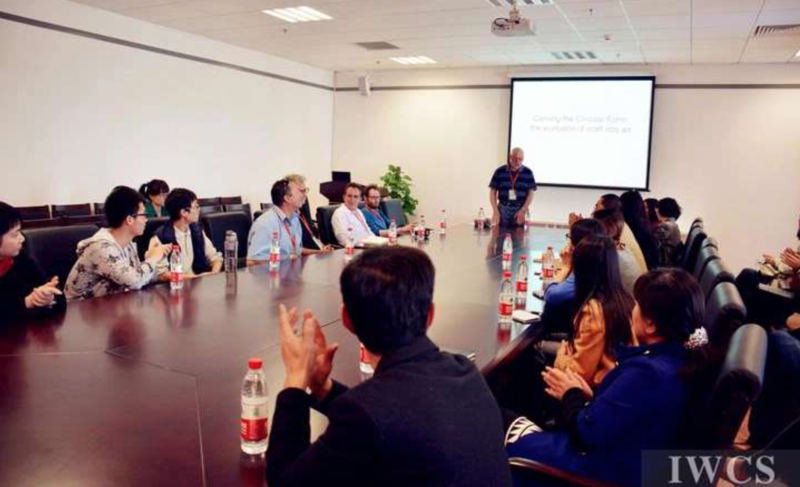 The cross cultural experience of the artists has been renewed and uplifted with the tour in Beijing, the political, cultural, and educational heart of ancient and modern China. Though the tour ends, the impact will carry on over time.